This hung in my dad’s workshop for about 20 years and has hung in mine for about 30. The hardest part of this blogfest was narrowing the field of cherished objects down to a single item. The second hardest part was staying south of 500 words because WordPress counts the photo descriptions and, well, I do tend to go on. I quickly decided that I would go with an item from my father, but that didn’t help me much. I have several of those. This one got the nod, courtesy of a recent project our daughter completed in my workshop. When I was about eight or nine, my father bought a table saw and a jig saw. The table saw was a Delta 9” contractor saw and was considered so dangerous to a man with two curious sons that he cut the cord to a length that wouldn’t allow the saw to be plugged into an outlet. Then he locked his extension cords in a closet. That also kept neighbors and relatives from using his saw. The jigsaw, on the other hand, was a pretty safe tool to operate. Not at such a young age, but a few years later, he was willing to let me try following a few lines on some scrap stock. He followed a set of jigsaw patterns from DeltaGram magazine. He made a bunch of mail holders that featured a mailman on one side (he was a mailman) and he made several of these plaques for friends and relatives. Once, when he was making one for his sister, I was helping and I asked if I could do some of the cutting. He didn’t let me do that, but he told me if I watched as he made that one, then he and I could make a second one for his shop. He did most of the work. He explained every step, and he let me make a lot of the cuts. That plaque, my first actual woodworking project, now hangs in my shop. Faith has been a companion in my shop since she was a little girl. She completed her first project with hand tools, but she has long since moved up to using power tools. A few years ago, my neighbor was selling the tools her husband owned before he passed away. One was a small Sears Scroll Saw. I bought that for Faith, as a way to start her workshop. It’s still in my workshop, because she’s in an apartment, but it’s her saw. As she was making a gift for a friend, I noticed the plaque on the wall and felt the circle completing itself. That’s Faith working on her project. I don’t have the originals, but I picked this up at a tag sale. The saw on the left is the one he purchased in the early 60s. Sandblasting the background away from the Jeep logo. I’m pretty sure we made a couple of these. The Jeep plaque is finished. This is where the plaque hangs today. Yeah, I’m still buying Delta tools. Visit the other participants in the Cherished blogfest here. That finished Jeep plaque is pretty. And the plaque on the wall says a lot about you–a lot that is good. I appreciate this share, Dan. Thank you. Thank you Peter. The plaque does say a lot. But it’s true stuff. The Jeep plague was fun to watch as Faith worked out the details. You are so right about women needing to know about tools. I think Faith could fix almost anything and I know she would try. Her first woodworking project was a small shelf for her room. She made it with hand tools and help but she did most of the work. Thanks Mary. I too have enjoyed reading the posts for this blogfest. So many, but so many lovely stories. We have a lot of things that she helped me make in the shop and I look forward to the day that she has her own shop (but I still hope she will visit mine). It is wonderful to see a craft passed down through the generations. Lovely and loving post, as always. I couldn’t help but think of the connection between your Father’s plaque and Faith’s name. ‘Faith’ is deeply embedded in your family in more than one way. It flows through your writing even though not often your specific topic. Dad taught us so many things but not carpentry tools, although he had and used them. Perhaps that was his alone time, as I now remember his chose to set up his workspace in the shed furthest from our house! I had a ‘duh’ moment – coming from a family who always had a jigsaw puzzle in the table but it wasn’t till seeing this piece that I realized why that’s the puzzle name. Thanks again for hosting. Great turnout and many interesting posts from participants. Thanks Sammy. The “faith” post is sitting in a drafts folder. One of these days. Alone time in the shop is rewarding but sharing woodworking with others is fun too. Thanks again for helping to spread the word. We do have a great turn out. I love how your father kept his children safe after buying the saw. Marvellous story. Thanks for reading. He did that right away. It wasn’t until many years later that he unlocked the extension cords. What a lovely art form! Even more special that it is passed down from generation to generation in your family. You must be so proud of your daughter. :) . Thanks for co-hosting this interesting blogfest. Thanks. Passing on a skill is a fun obligation. Thanks for supporting the Blogfest. What a beautiful, creative legacy of kinship Dan. I would cherish this memory as well. Nice woodworking too! Thanks. I have to give my dad most of the credit but I remember cutting and threading the blade through the holes for the inside cuts. It’s fun to pass that on. Wonderful to see a young woman who transcends traditional gender categories. Faith is at home in the shop and spent some time under a Triumph Spitfire before we had to give it up. She’s also a pretty good cook. Thanks Don. Thank you. It is a reminder of many things. Faith is a very talented young woman. A touching memory. It is no wonder the plaque is so cherished. To work with your father must have been wonderful. It was John. I wish he had lived long enough to see his granddaughter carry on the tradition but I’m happy to have the memory. We all wish that for our parents. Sadly it is a rare thing. Thanks Amy. Faith has a remarkable gift for composition. She know what will look good. It’s a pleasure to help her learn the techniques to make her vision come to life. Your cherished object is very similar to my father’s. He has a scroll saw that is one of his most cherished things that he owns. Great post. Love the Jeep sign! It turned out great. Faith has such a skill! Thanks Amanda. I do like the Jeep sign. So does the person she gave its to. Scroll saws are fun. I had forgotten how much fun. so cool! and how thoughtful and supportive! lots of meaning in this cherished thing and it says a lot about the giver and the receiver. thanks for sharing the story! Thank you! It was hard to choose but maybe we’ll do this again next year. It’s wonderful Dan. No wonder it means so much to you. Thanks Teagan. It’s a memory, a success story and a reminder of the lessons learned from my dad. I don’t know for sure, but I think it goes back to my grandfather. He died when my dad was only 4 years old, but my dad had and used some of his tools. Some things can be learned from books and videos but somethings are best handed down through generations. Thanks for the comment Christine. Thanks Deborah. It seems like a priceless possession. I was waiting for so long for your post to come up. I love the way you narrated how your father passed the knowledge and skills to you and now you’re passing it on to Faith, or probably she has that talent in her DNA. I think you’re right Sharukh – and she gets it from both sides. My dad loved theatre and my mom loved movies, probably that is why I love any kind of art that involves stories. Oddly, with the two men I am sending this off to, they went from power to hand tools as both do conservation/restoration work. Steve is always prowling for used handtools which he restores as a hobby then sells or keeps. I don’t think any of his daughters are following in his footsteps, though one paints. We sometimes will do things in the shop with hand tools instead of power tools. I always like to know/show what a power tool is doing by demonstrating the hand tool(s) it replaced. People who truly understand the old hand crafts are amazing to me. I’d love to see some of the work these guys do. Thanks! Dan, this is a wonderful post – layer upon layer of cherished activities, items, and people. I’m reading it first thing on Sunday morning which seems, well, just right. Thank-you for organising this blogfest and I hope you do run it again next year. I have so many items Jill that I have to have it happen again. Thank you for supporting it. Such a wonderful gift, the joy of woodwork passed from your dad and to your daughter. Beautiful! Thank you. It’s so rewarding to see a new generation learn tried and true techniques. Thanks for reading and commenting. I am very happy that she enjoys woodworking and other ways of making things. She is very talented and she learns quickly. Thanks for reading and commenting. Thanks. She has always been interested and now she is fairly well along. Such a beautiful post, Dan. I enjoyed reading this. Thanks Lois. This has been fun and rewarding. 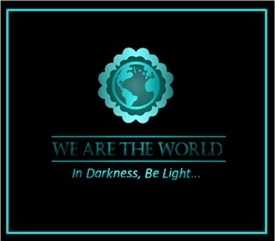 so inspiring to read, am glad to visit your blog, thank you for sharing ! I love this post. A beautiful and sewwt story. Thanks for sharing. goodness: SWEET story. sorry about that. Life does come a full circle, doesn’t it? That’s a beautiful plaque, Dan! The Cherished Blogfest has triggered a spate of memories for me, even as I contemplated what to choose among the numerous cherished objects around me. I like to think that we take the best from each generation and pass it along. It was hard choosing a single object. Thanks for supporting the blogfest. Hello! I really like that this led into a story about a hobby passed down. I find that sort of thing intriguing and very cool. My parents never gave me anything that could make these sort of memories, so I liked reading this! Thank you for the nice comment and for supporting the blogfest with your post and visiting. Ironically, the jigsaw sort of skipped a generation. I don’t own one and I haven’t worked with one since I was still living in my parent’s house. I do remember enjoying it though. Very moving post. I enjoyed the story element too, especially the coming full circle aspect. And as always, perfectly complemented by the photographs. Thanks Paul. It was hard to select one item, but she made her project while I was still deciding. This post was amazing. The pictures were wonderful, the full circle aspect was a great conclusion, and I am glad to see generations continuing such a cool craft. It is rewarding to see her continuing a family tradition.Thanks! I loved hanging out with my dad when he was in our garage doing daddy stuff at his workbench. He finally built one my size next to his so I could “work” along side him. Wonderful post! That’s so cool. We started getting Faith a tool at Christmas every year when she was very little. My dad loved working with wood, too, and although it was only a hobby, he had all these supersonic, über professional tools in his workshop (he took over a whole room in the house and turned it into a wood-working space). I suppose he never thought I was at risk of plugging any of them by mistake or curiosity, being a girl, because that workshop wasn’t even locked. (And I still have all fingers and toes intact.) He died 23 years ago, without once teaching me as much as how to put a nail into a plank, but today I own my own jigsaw and table saw and other cool machinery, and I’ve built a couple of wooden fences at home (okay, the same fence twice, once built then dismantled then reassembled in a different location). I think Dad would be proud–as I’m sure you are of your daughter. That Jeep plaque is *amazing*! Great post, Dan! Thanks for hosting this awesome hop! I am sure your dad would be proud. Teaching yourself how to do those things is a great accomplishment. Thanks for supporting the blog fest. I’m on my way to your site now. Really, really enjoyed this post, Dan. I still to this day use the first tool my dad ever gave me — a pink screwdriver! I never had any “toy” tools because my dad wanted me to have real tools that I could work alongside him with. Reading about you and Faith always reminds me of how it was for me growing up too. I think the plaque was the perfect choice for the blogfest! Thanks Wendy. We started giving Faith real tools when she was very young for the same reason. She had toy power tools (drill, etc) but real hand tools. This was a lot of fun, but the memories are precious. What a lovely cherished plaque, story, and tradition/skill you have, and have passed onto Faith. I had to take woodshop in 7th grade or maybe it was 8th…My memory is fuzzy there, but the teacher! I’ll never forget him. His safety talk on day 1 scared me to death. I was terrified of the saws and tools after that. He talked of many missing fingers, caught hair in the lathe, and other such horror stories. I wanted out of that class so bad! I made a lamp, a serving tray, and salad serving pieces, but used a piece of wood to push the work toward the blade if I couldn’t talk someone else into make the cuts for me. Faith is made of tougher stuff than me! I remember that safety lecture, and we did have a couple of accidents in shop, but they were rare. I took wood shop every year from 7th through 12th grade. I just loved it. I still guide things through the saw with a push-stick, that’s a very good idea. I can still count to 10, but I’ve come close to having to work in Base9. Thanks for reading and commenting. Dan, your first woodwork project, is a testament of who you were as a young man and who you continue to be today as a grown man. Thank you for sharing the warm, loving, and cherished memory. 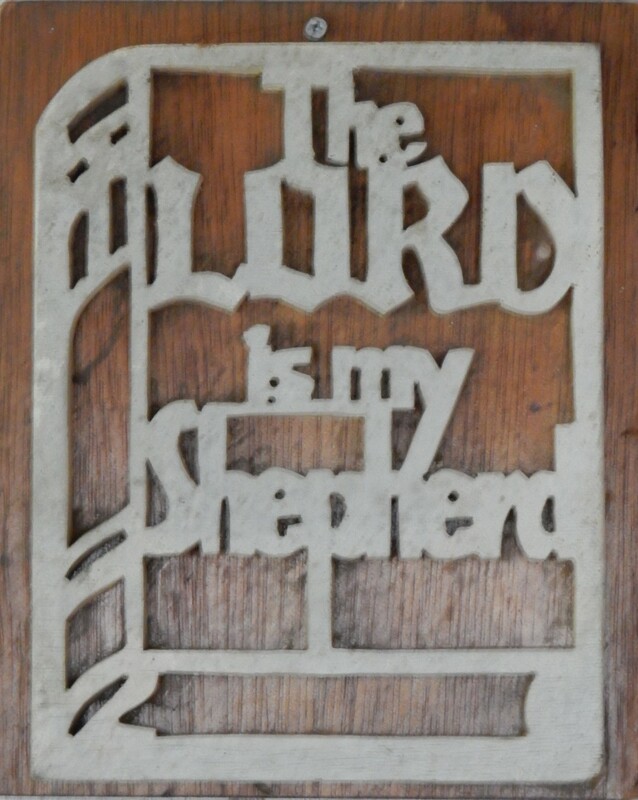 The Lord is my Shepard has been hanging in the workshops for about 50 years and it still looks fresh. Oh, I wish I was even a tiny bit like Kate…learning from my parent. She’s got a lot of talent going on for her. Something funny…when you mentioned jigsaw ( showing my lack of knowledge here), my mind went to a puzzle:) I thought your dad bought you and your brother a puzzle, another type of learning “tool” :) Okay, you can stop laughing now! I don’t think you’re alone in the “jigsaw” trap Elaine. I am now waiting for Faith to read this and realize that we could make our own jigsaw puzzle. Let’s hope is under 500 pieces. I had to blow the sawdust off the plaque, but it has held up well over the years. Thanks for continuing to support this blog. Thanks! I do like that both the jigsaw and sandblasting are processes which (normally) remove material and reveal the result in what remains. Thanks for reading and taking the time to comment. I have some tools that my father got from his father and they still work Paul. But yeah, let’s not rush the hand-off. Thumbs up to Faith! I love a woman who is not afraid to use power tools. I’m scared to death of them! Beautiful work, Faith. Thanks Sandi. She’s careful but not afraid. It pays to be careful around machinery! Thanks Sue. I know he tried. Some of the lessons he taught me took a long time to sink in. This is an outstanding wood project and such a great keepsake. I like when skills are taught by parents or grandparents. I did a post about crafts which also means more than little projects, like quilts or wood crafts. It’s good that you liked it because I couldn’t tell the difference. I’m not good with spotting typos. The project was fun, but I think anything you do with a parent/mentor where you are learning at someones side, is a good project. Talents and skills like sewing and working with fabric are almost lost today. It’s a good thing to pass on. This one was corrected and sorry I was pushing post and could you delete this one please? I accidentally liked it, too. Thanks! What an amazing woodworking project. You taught me great things through this. Very detail and informative. Thanks for sharing.